Today is just the perfect day for a colorful adventure!Â Itâ€™s Valentineâ€™s day and Chinese New Year at the same time!Â To add up to the flavour,Â The last day of the 15th Annual Hot Air Balloon Festival 2010 happens today! Vince and I packed our gears at around 2am.Â We have to thank Sony for lending us a very powerful video camera â€“ the Sony Handycam HDR-XR520, and Marquee Mall /Ayala Malls for the Passes! I drove from the house to Clark while the monkey sleepsâ€¦ (â€˜coz I know itâ€™s harder to drive on our way back home kekeke)â€¦ It took us only about an hour and a half (including Restroom breaks and snacks).Â No traffic at this time!Â We arrived at the grounds at 4:30.Â We got hungry again so we ate at the kiosks aroundâ€¦ The sun wasnâ€™t still up and the whole area is still covered with a black blanket at some glittery stars. Then, we heard the song â€œ?!?! ?â€ — I forgot whatâ€¦ but I liked the song and it kinda signaled that the balloons are being prepared for flight!Â Off we went and take pictures!Â I donâ€™t know how to estimate as to how many people were there but It filled the area! There was a complete list of activities for the dayâ€¦ but I think, our lack of sleep yesterday made it hard for us to keep going.Â I would have wanted to see the fireworks as well at nightâ€¦ but we figuredâ€¦ we really were getting restless and tired so we decided to go home instead.Â I slept for a few minutesâ€¦ then I heard the monki slapping himself (lol) He was way to SLEEPY!Â We needed to pitstop at a gas station at got our coffees from Gloria Jeans. The Candy is trying to get a nice angle… There were so many people! I love taking pictures of this balloon! Sun is shining… the weather is sweet! I love this picture! I look so tall! Who wanna mess wifff Candy? yarrrr!!! 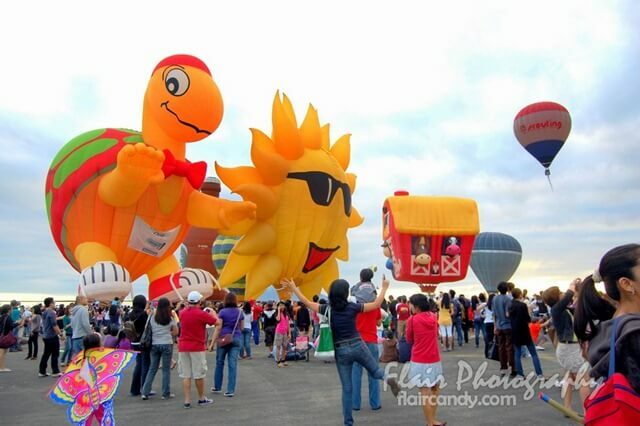 Ang gaganda naman ng mga hot air balloons na kasama sa festival hannah! wow, i hate it that this was the first balloon fest that i missed since 2007. the weather this year looks awesome, last year was terrible. awww, i wish i’d be able to attend this event next year! been wanting to attend one for sooo long! Thanks Eudora 🙂 you too! riding the balloon i think goes around $150 since the balloon pilots are from germany, france, etc. PIETER ESTERSOHN Charlotte Moss says spiked christian louboutin her new book is “my show house, christian louboutin pigalle and it’s about where I start.” use what we have; make it work.” Accessories cannot be the stepchild of decorating. bridal christian louboutin How is “Decorates” different from your other books?This book is about the beginning of the design process.